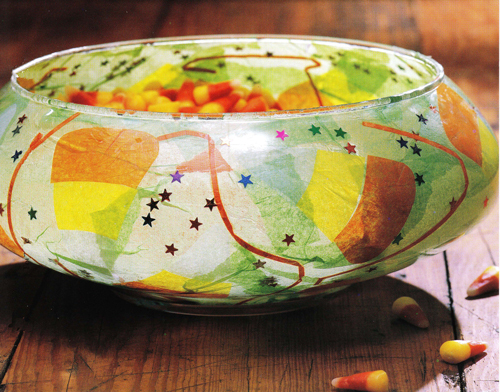 Use tissue paper in Halloween colors to turn a plain glass bowl into a cute container for candy corn and other treats. This quick and easy craft designed by Heidi Borchers of Inspired at Home is a great way to decorate for Halloween. Transfer patterns to tissue paper and cut 1 white tip, 1 yellow center, and 1 orange base for each piece of candy corn. Working over small area at a time, brush coat of glue on inside of bowl in desired position. Press tissue paper pieces into glue to form 1 piece of candy corn. Brush coat of glue on top of tissue paper pieces, pressing out any air bubbles with fingers or wet brush. Repeat to apply tissue paper pieces for additional candy corn designs. Apply glue to inside of bowl and press paper shreds and star confetti into glue. Tear light green tissue paper into random pieces. Crumple each paper piece and then flatten it, leaving some wrinkles. Working over small area at a time, brush coat of glue on inside of bowl in desired area. Press 1 tissue paper piece into glue-coered area. Brush coat of glue on top of paper, wrinkling paper to add texture. In same manner, apply additional paper pieces, overlapping them for added dimension, until you reach desired effect. Let dry. Heidi’s designer tip: This tissue paper layering technique works best when you keep the surface moist with glue. Any time the brush starts to tear the tissue or feels like it’s sticking, just dip it in and apply more glue. Don’t overdo it with the glue, just keep the surface moist until the final piece of tissue is applied. I do love the look of this, and it seems like it allows for my creativity to flow with my own ideas. However, I am confused about the food safety of this dish. I don't understand how we can put candy corn in there with the glue being used over the tissue paper. I don't see anywhere in the DIY that there is a protective coating put on there.